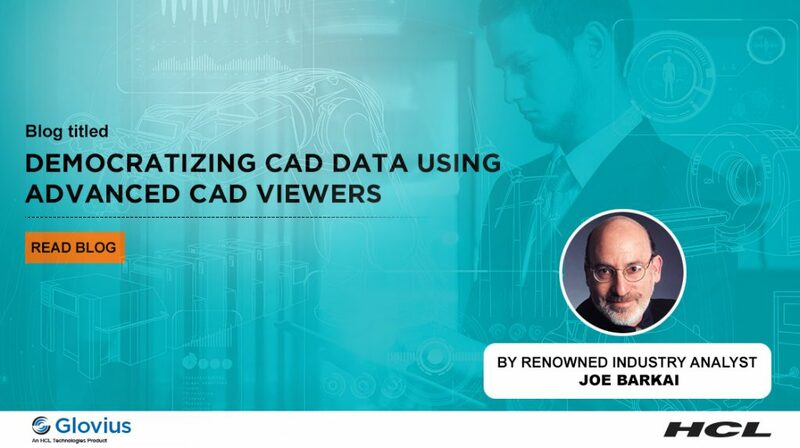 Read this blog by renowned industry analyst Joe Barkai, where he discusses the democratization of CAD data and how various departments across the modern enterprise are benefiting from access to CAD data. Joe also shares insights about how two companies (Buck Lighting and the Indian arm of one of Japan’s largest automotive company) use Glovius to provide company wide access to design data to departments such as design, manufacturing, purchase, among others. Click on the image below to read the full blog. Visit our stand at the Farnborough Air Show for a demo and how Glovius offers a complete 3D Visualization solution for the enterprise. Read the full CIMdata Commentary here or download the full commentary. 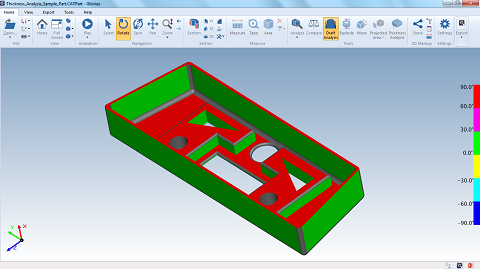 – A successful CAD collaboration visualization solution must be cost effective, easy to use, and platform independent. – HCL’s Glovius solution meets all three business challenges and delivers important capabilities into the hands of downstream users of design data within the organization and the supply chain. – Glovius directly imports CAD and standard CAD formats without needing a license to any CAD solution. Collaborative visualization holds the promise of transforming product development — reducing time to market, improving product quality, and enhancing product capabilities to best satisfy customer and market needs. Initial entry into collaborative visualization begins with the ability to leverage design engineering’s virtual CAD models and share them with downstream technical and business organizations, the supply chain, and customers. An effective collaboration visualization solution, however, requires extensive capabilities beyond just viewing. The collaborative visualization solution, Glovius from HCL Technologies, offers CAD independent viewing and data access. 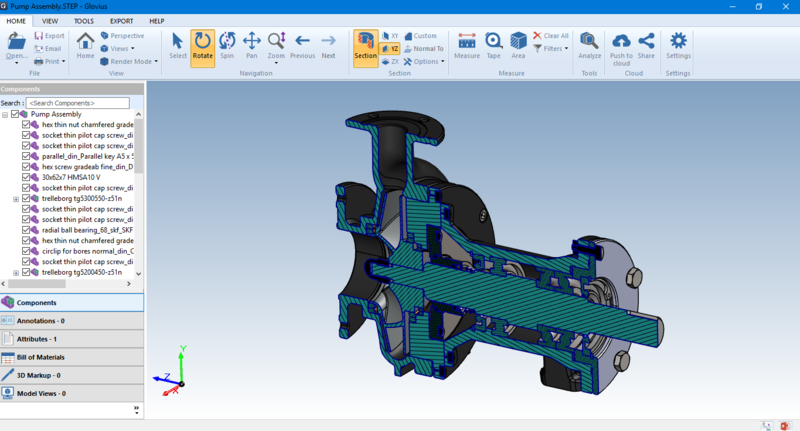 Aptly called a “Modern CAD Viewer” because of its ability to run on an extensive range of platforms including tablets and smart phones, Glovius offers capabilities such as dimensioning, sectioning, markup, 3D compare, and analysis tools to all levels of users. CIMdata recognizes Glovius as a major player in the collaborative visualization market. Glovius delivers a strong collaborative visualization choice for users looking to improve their data sharing experience during product development. HCL Technologies has positioned it well against the three major business challenges of being cost effective, easy to use, and platform independent. The result places Glovius in the forefront of effective solutions for collaboration visualization. CIMdata recommends that users looking to improve their downstream and supply chain interaction take a look at Glovius as a possible vehicle to drive those improvements. Glovius v4.4 (build 4.4.0.454) for Windows is now available. We are happy to announce a new release of Glovius v4.4 (build code 4.4.0.454) for Windows. This is a free upgrade for customers on a valid maintenance plan. 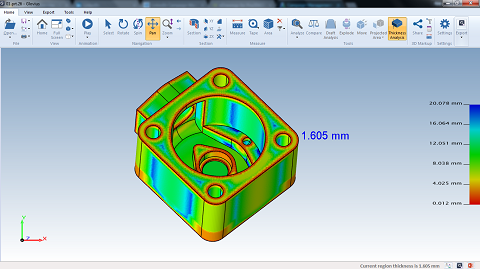 New design analysis tools, useful in Die Casting and injection Molding Applications. Thickness Analysis – Wall thickness analysis for part files. 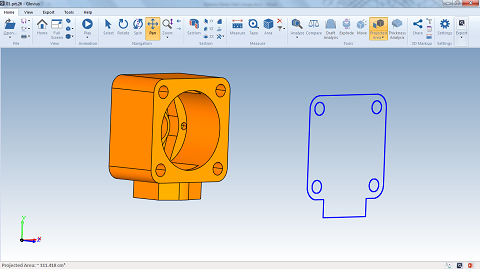 Draft Angle Measurement – Draft angle measurement for parts along a separation plane. Projected Area – View projected area over a directional plane. Export 3D data to HTML (in addition to 3DPDF) for viewing in a browser. For more information, write to support@glovius.com.